Most of the people find it really difficult to achieve a flawless beautiful skin. To remove or lighten the sun spots, tans, and melasma. To remove the scars, dark marks, birth marks. To reduce the visibility of hyperpigmentation from acne. Lessen the appearance of skin discoloration. Overall lightening of the skin tone and to achieve glowing skin. Skin lightening is a method that implements the use of topical creams and various laser treatments that can provide an even skin complexion by reducing the melanin concentration. The extent of melanin determines the colour of the skin. People with dark skin tone have a greater amount of melanin concentration in their skin. This melanin content in skin depends on the genetic structure, hormones, skin damage, and skin exposure to sunlight. For some superficial skin pigmentation like the suntan, topical bleaching creams containing hydroquinone, arbutin, kojic acid, azelic acid, the retinoic acid in various combinations together with the regular use of sunblock are advised and may help to some extent. Skin darker pigmentation is usually caused by excess production and/or clumping of the skin pigment ‘melanin’ with the appearance of darker brown or even black spots on the skin. Pigmented lesions can be classified either based on the location of pigment as epidermal and dermal or based on causation as sun tan, sunburns, post inflammatory, drug induced, hormonal, etc. – and the treatment depends on the underlying cause. Most pigmentary skin lesions, whether epidermal or dermal, acquired or congenital, can be treated with Q-switched lasers (also called as Laser Peel). Fractional Q-switched lasers specifically target and eliminate pigment embedded within the skin without injuring the surrounding skin. The laser energy which is delivered in billionths of a second microscopically disrupts the pigment into tiny particles that are naturally cleaned-up by the body’s lymphatic system. Occasionally for some mild pigmentation, Fractional Erbium Glass 1540 nm is an ideal treatment modality. 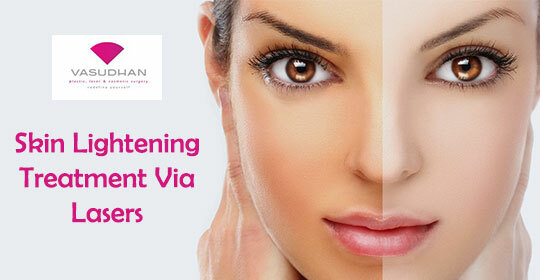 The primary aim of the laser is to get rid of the pigmentation and achieve an even skin tone and glow. Some hidden benefits include rejuvenating skin with reduction of wrinkles, enlarged pores and scars. Laser treatment may require multiple sessions at intervals of 3-6 months, each session lasting 10-20 minutes (office procedure). clear description of the challenges. It was truly informative. Your website is extremely helpful.Many thanks for sharing! I look very dark …………………i just wana look bright i don’t want darkness on me!. Someone told me that laser treatment for skin whitening will treat. So can you please tell me how much does it cost? Wow, amazing weblog layout! How lengthy have you been blogging for? You have made the blogging look easy. The overall appearance of your website is great, as well as content too! It’s really great to see your summary which looks pretty nice and rules updated over here looks functional and favorable to all those who have some positive attention on such issues.